Baby Rhino Leo at Baby Rhino Rescue | Adopt and Donate Now! In December 2016, a female rhino was shot in the Orpen area of the Kruger National Park. Soon after this, a rhino calf was found and a helicopter was called in and he was taken to Care for Wild. After spending his first night on drips, he stabilized and his blind fold was removed. He was introduced to two other rhinos, both his exact size: Zack and Jemu. Leo was about six months old, which means he was born in Winter. 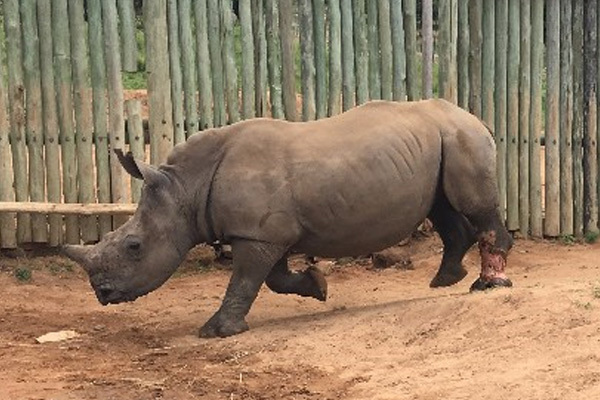 The winter babies are typically less strong than rhino babies born in summer. The mother will have less food to eat, so her milk won’t be as rich. There is always extra special care given to a winter baby when it arrives at CFW. In the same week a lovely young female arrived, exactly the same size as Leo and the two immediately bonded. They are now a couple, and everyone is looking forward to the day that Leo makes Spirit pregnant! The four young rhinos: Leo, Spirit, Zac and Grey are a wonderful crash. All these rhinos are the exact size and age. We were thrilled that Leo was named Matt Grossman’s son Leo. Matt donated the funding for many of BRR special projects, including the stronghold!